WinField United retailer to review sampling data and prepare fertilization plans for next year.
" allowfullscreen="" frameborder="0" height="315" src="https://www.youtube.com/embed/Farmers submitted over 42,000 tissue samples for analysis by WinField United teams this year, and the data shows that crops could benefit from fertilization adjustments made in-season. Here are some nationwide trends revealed by tissue analysis conducted by WinField United in 2018. Key essential nutrients for corn were limited. Corn plants could have benefitted from in-season nutrient applications based on analysis of over 26,000 tissue samples submitted from across the country. The most common deficiency was zinc; nearly 78 percent of sampled plants were short on the nutrient that aids in chlorophyll synthesis and other metabolic functions. Potassium, nitrogen, manganese and boron were also commonly deficient or responsive. Soybeans had a sharp increase in copper deficiency. Nearly 75 percent of soybeans sampled lacked sufficient copper levels to meet plant health needs. This is up 10 percentage points compared to 2017 and 34 percentage points compared to 2016. Copper is a key nutrient for protein synthesis, cell wall formation and many enzyme systems. A majority of soybeans were also low in potassium based on analysis of over 8,400 soybean tissue samples. Wheat lacked micronutrients. Chloride deficiency was widespread across wheat crops last year, with nearly 85 percent of sampled plants lacking adequate concentrations of the nutrient. Limited availability of chloride can disrupt plant metabolism, including water regulation in cells and plant enzyme activation. Copper, boron, zinc and magnesium were also limited in most wheat crop samples. Cotton was deficient in potassium. Nearly 90 percent of cotton samples fell into the deficient or responsive category for potassium levels in 2018. Potassium is an essential nutrient that is important for fiber development in cotton. Phosphorus and copper were also commonly deficient based on over 1,300 cotton samples submitted for analysis. Alfalfa was short on calcium. Similar to last year, over 90 percent of the more than 400 alfalfa samples analyzed had low levels of calcium in 2018. Calcium aids in nitrogen uptake and nutrient absorption, and it contributes to enzyme activity in plants. The majority of alfalfa samples were also short on magnesium and phosphorus. The WinField United sampling database includes more than 475,000 data points that help identify nutrient trends based on geography, soil type and environmental conditions. 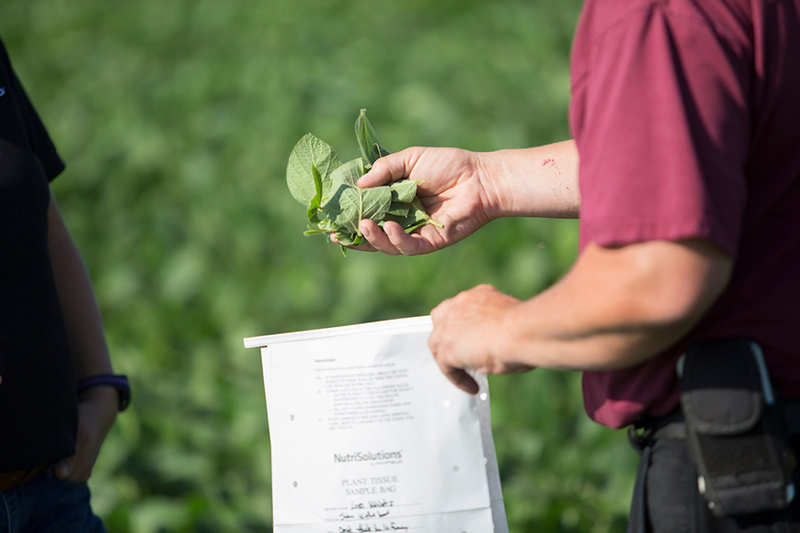 Based on analysis in 2018, it’s clear that a crop’s nutrient needs vary depending on growth stage, reinforcing the need for tissue sampling throughout the season. It’s not enough to know what nutrients may be limiting plant development. To optimize plant performance, consider the timing, source and rates of fertilizer applications. Tissue sampling, combined with soil sampling, can help you assess crop nutrient availability to fine-tune fertilization applications. Now is a good time to speak with your local WinField United retailer to review sampling data and prepare fertilization plans for next year. Farmers submitted over 42,000 tissue samples for analysis by WinField United teams this year, and the data shows that crops could benefit from fertilization adjustments made in-season.